Experience unique geologic wonders, pristine alpine lakes, snow capped peaks, and breathtaking Sierra scenery on these classic Mammoth area hikes. Vacation planning for Mammoth mountain area. Skiing, rock climbing, swimming, boating, and more! Locally owned free ski and snowboard shop in Mammoth Lakes - for all your Mammoth skiing needs. We test and support all the items we carry. Remember to practice leave no trace ethics while hiking and leave the wilderness as you found it. Panorama Dome is great a short hike with a big pay-off in views. To arrange your own once in a lifetime hiking trip, contact one of the experienced guides located on this page. Nestled in the heart of the Inyo National Forest, Mammoth Lakes boasts enough hiking to keep even the most ambitious trekker busy for a lifetime. We’ve compiled a list of a few of the areas more popular destinations. This short 1 mile hike (round trip) brings you to the rim of the Inyo Craters. This is a great hike if you’ve only got an hour or so. Take this one mile trip to the summit of Panorama Dome to get a breathtaking 360 degree view of the eastern Sierras. This 1.5 hour hike circles beautiful Convict Lake. This is a perfect route for someone looking for a backcountry experience without taking a ten mile walk. Along the way, stop to fish or take in views of Mt. Morrison. Head out for a few hours, a few days, or a few months on this epic 2,650 mile trail between Mexico and Canada. If you’re looking for gear, lessons, or advice, take some time to explore the suppliers, outfitters, and shops located on this page. They provide expert advice and invaluable local's only knowledge. Bury all human waste in a hole at least 6 to 8 inches deep, located 200 feet away from all trails, camps and water sources. The Complete Guide to John Muir Trail offers information on the trail, planning, and resources. 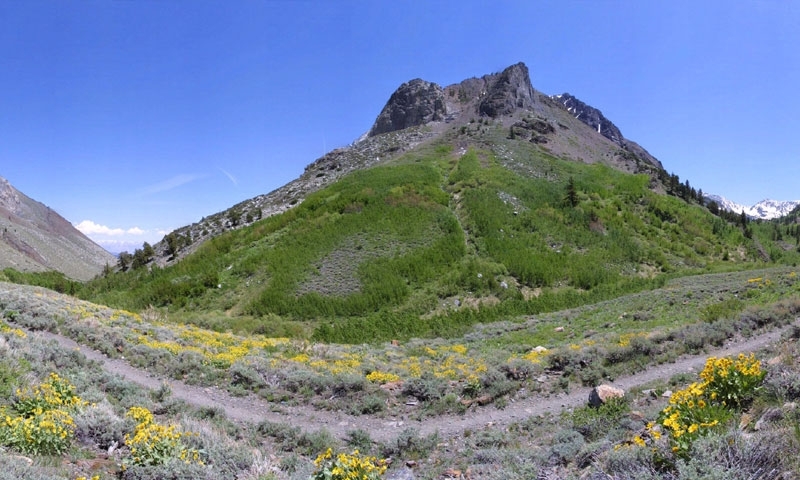 Mammoth Lakes Trails and Public Access is an organization that maintains and protects public trail systems in the Mammoth Lakes area.